Aside from house parties, I haven't found out too much that's going on in our neighborhood for Halloween. There are a few things, however. Wonderland is hosting a costume contest tonight with Funk DC. There are prizes and guest judges include city council at-large candidate Patrick Mara. There are haunted houses at MPD's Third District station and substation tonight for kids age 3-14. The station is at 1620 V St NW and goes from 6 pm to 9 pm today, and the substation is at 750 Park Road NW, going from 6 pm to 8 pm. Tonic (out of the neighborhood, but just barely) is having a Halloween party tonight also. Apologies for the lack of posts, I was in Miami for a few days, then in Delaware. One was more fun than the other. Stay tuned for Halloween stuff in the neighborhood, etc. One of the organizers reminded me the other day that I forgot to write about Columbia Heights Day - so here goes. In all, I'd say it was a success and a good time. There were a few hundred people there when I came by about 2 pm, and there was a good amount of stuff - cupcake eating contest, petting zoo (with camel! ), a bouncy castle for kids, and various booths for non-profits, politicians, and a few craft types. We hit everything in about half an hour, then went over to Wonderland to take advantage of the drink specials (it was also Oktoberfest at Wonderland, so my pals got German liederhosen bib things). I enjoyed it. I do have some criticisms and suggestions though - for one, there wasn't much food. There was a Taqueria Distrito Federal booth in the back, but it was out of food when I was there. One of the organizers, Jeff Stein, told me they had another vendor pull out at the last minute, concerned they wouldn't make any money. Hopefully next time they'll stick it out, and I hope they add some more food booths - at least local eateries, though fair food like at Adams Morgan Day (turkey legs, funnel cakes etc) would be cool. There also wasn't much in the arts and crafts department, though there was a funny t-shirt place called T-Shirt Insurgency, and a painter. I'd like to see more of that too - maybe they can advertise for vendors. And I was looking forward to seeing a zebra at the petting zoo, which was advertised on the site, but Stein said they have to choose between camel and zebra. Apparently the zebra can't be petted and it only walks around for a little bit of time, so I think he made the right choice. I didn't hear much music either, it was mostly one guy with a guitar or one guy doing something else - I'd like to see more local bands. There are a zillion who I'm sure would like to play. In all, I think it was pretty cool. Anybody else go? What did you think? Know of any brothels in the hood? What!? I just got sent this from NBC4, apparently two men tried to rob an alleged brothel somewhere in Columbia Heights, and in the ensuing struggle, one of the victims chopped one of the robber's thumb off with a machete. Wow. The thumbless robber, named Bryan Perez, went to the hospital, the police brought the thumb, and there was a match. Busted. That is probably the weirdest Columbia Heights crime story ever. I'm trying to figure out where the brothel was, but now you can have fun with your friends by sending them the article and saying "sorry your house got robbed." UPDATE: Wait a minute, there was a shooting at a brothel last week too, on 14th Street near Quincy. Maybe it's the same place? Is there a rash of brothel crime in the neighborhood? Are there really that many brothels in the hood? What is this, Amsterdam? UPDATE 2: The Examiner has the full story on the machete incident - the address is 3827 14th Street NW, which is in fact near Quincy - maybe it's the same place as the shooting. The article says there was an underground gambling establishment on the first floor and a brothel upstairs. What in the world. And technically, the location is in Petworth. Dang news always trying to make Columbia Heights look bad. UPDATE 3: The two events are actually the same thing - there was a shooting and the thumb chopping off happened at the same time. Geez. Just saw this, the Washington Area Bicyclists Association, DDOT, and Alexandria are giving out free bike lights on this Thursday, Tuesday the 28th and Thursday the 30th at the Shrine of the Sacred Heart Catholic Church at 16th and Park (3211 Pine St NW). They're also giving them out at 18th and Columbia. They're free until supplies run out, so go help yourself not get hit by a car! Sticky Fingers Bakery won the "best vegan desserts" category of the recent VegDC Three Green Stars competition, decided by reader votes. Pretty cool for the locals. I like their coffee drinks, pretty solid. The desserts are a little too sweet for me - what I've had, at least. Anybody have any favorite things there? Sticky Fingers is at 1370 Park Road NW. I saw this sign the other day at 13th and Columbia (I think) - it's an ad for a candidate for at-large council. 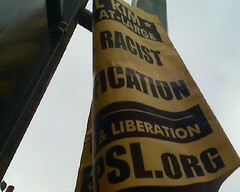 Unfortunately I can't see it since it's curved, but it says something about "racist gentrification" and lists votepsl.org as the website. Kind of cool to see some different political advertising out there, though I don't agree with the sign. I saw this yesterday at Target, pretty awesome. 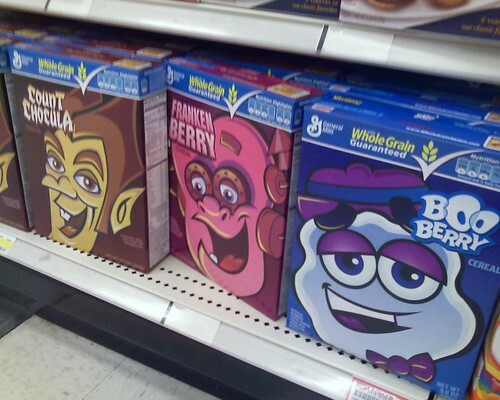 I guess it's for Halloween. If you haven't had them they're similar to Lucky Charms, but better - corn cereal bits and marshmallows. Here's the Wikipedia page about them. What neighborhood is Columbia Heights like? I saw this on DCist, it's a site called Homethinking that compares neighborhoods from one with neighborhood in another - for example, DC to NY, or LA to SF. It has a lot of cities, and it's generally fairly accurate - even with, say, Knoxville, Tennessee, though Philly is apparently messed up. Neighborhoods scores are initially calculated using demographic data from the US Census and other public sources. Wide numbers of demographic factors, such as age, marital status, whether the household has kids or not and the frequency of arts and culture activities, among other variables, were compared. The scores are then refined over time by reviews from people just like you. Could be, I'm not so sure about the DC vs Manhattan though - it says Columbia Heights is like the Financial District, which is preposterous, and Harlem and Yorkville, which seems a little more accurate. For DC vs SF, it says Columbia Heights is like the Mission, which is reasonable. The cool thing is, you can edit the ratings, as I did for Columbia Heights vs Financial District. Ellwood Thompson's spokesperson Lesley Johnson sent me a couple videos about the store, and said it's going to be about 15,000 square feet. Ellwood Thompsons // At A Glance from Ellwood Thompson's on Vimeo. Hopefully you're registered to vote and will be voting next month! 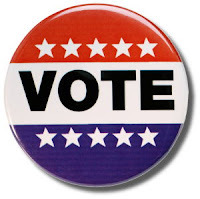 If so, and your precinct is 39, the Mount Pleasant Public Library (it says on your registration card) then you'll be voting at a different location: Bell Multicultural High School at 3101 16th Street, N.W. Stay tuned in a few weeks for New Columbia Heights' local election endorsements! One of the Bands in the Neighborhood, DoS, plays Wonderland tomorrow with openers Aubriot, who are also from DC area. DoS will be in Halloween costumes, which sounds pretty cool. Check them out. Aubriot goes on at 8:30. An astute reader emailed me a little while ago asking about RSS, so I just set up a feed - you can add it on the "Subscribe" section just below the blog map. Let me know if you have any issues with it, I'm no expert. I walked by Nori yesterday, the new sushi spot where Mayorga used to be, and they were putting up signs and such. One of the waiters said they were open, so I poked around a little. It looks nice inside and they sure did it fast. I didn't eat there, but look for a review soon. They're at 3301 14th Street NW, and here's their Yelp page. --2702 13th Street (13th and Fairmont) from 9 am to 2 pm - clothes, furniture, books, music, and other "cool and inexpensive things and do-dads." And there will be an Xbox, either for sale or as a raffle. Just saw this photo on Flick by MV Jantzen. Pretty cool. I'm starting a new series called "Taking the Bus," where I'll look at bus lines that go through Columbia Heights and where you can take them. The first installment is the H2, H3 and H4. These lines are handy for me because they cut across the city east to west, ending at the the Van Ness (H2) and Tenleytown Metros (H3, H4), meaning you don't have to ride the Metro down to Gallery Place to get on the Red Line to get there. The lines are handy for trips to Whole Foods, Tenleytown, Fort Reno, and stuff like that. Both lines go down Columbia Road westbound and Harvard Street eastbound through the neighborhood, then go on Porter and Quebec. To the east, they go past the Washington Hospital Center and end up at the Brookland Metro near Catholic University. It's a pretty handy bus route - check it out at Metro's site. I've been thinking about the reputation of Columbia Heights lately. It was spurred by this: Washingtonian magazine, which is sort of a society/upscale magazine, is having a reader happy hour in CH at the Highland Park at 14th and Irving. 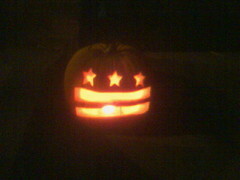 In their blurb, it says "Not familiar with the Columbia Heights neighborhood? 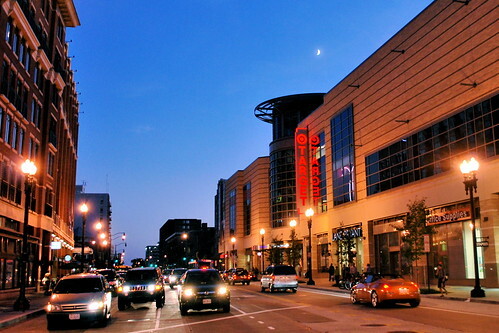 It's a vibrant neighborhood north of the U Street area, filled with new development—and not to mention some of our favorite spots!" It kind of made me think, huh, how could you not be familiar with this neighborhood? There's a Target, Best Buy, good restaurants, etc etc. It's been in the news a lot. The neighborhood used to have a pretty bad reputation for crime and such - at least to outsiders. Do you think it still does? Maybe that's why folks don't know about the neighborhood? A few times in the past week I've been asked by folks if it's true what they say about Columbia Heights. I'm usually confused by this - what, there's a Target? But they're referring to crime, thinking it's a dangerous neighborhood that you shouldn't go to. To me, that's crazy. I've only had one incident with crime here, and that was before I even lived here. Since then, nothing at all, other than the occasional weird guy in the alley, but that happens everywhere. I feel like most of the crime would never really affect me - it seems to be drug-related or from various "crews" against each other. Of course, there's some random muggings and such, and obviously that's terrible if it's happened to you, but to me those seem fairly rare. So what do you think? Is the danger overblown? Is a supposed dangerous reputation warranted? Found this on Youtube, it's a few interviews with folks at the DCUSA shopping center. I think it was done by a student. One guy says the foot traffic reminds him of Europe. 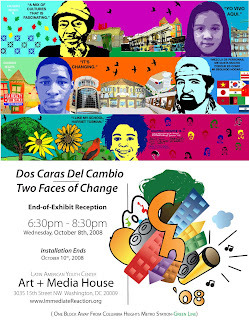 The Latin American Youth Center's Art + Media House, a cool nonprofit, is having an open house tomorrow. The group got together 40 kids this summer to design and paint the mural on Kenyon Street across from Wonderland as part of their "Dos Caras Del Cambio | Two Faces of Change" exhibit, which also features student art. The open house also serves as the closing reception for the exhibit. LAYC Art + Media House, 3035 15th Street NW. Here's a link to the flier. Ellwood Thomspon's deal signed! Really! I just got this press release straight for the horse's mouth, Ellwood CEO Ryan Youngman, who said the deal was signed about 10 minutes ago. So it's official! Included was this image of the store, which will be on Irving Street. October 7, 2008 – Richmond, VA - Ellwood Thompson’s Local Market, Virginia’s largest independent natural grocery, is pleased to announce its expansion into Washington, DC. As the company prepares for its twentieth anniversary, it will open a new store to serve the Columbia Heights and Mount Pleasant neighborhoods. 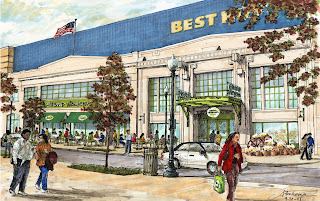 Ellwood Thompson’s new store will be located in the DC USA development at 14th and Irving Streets, NW adjacent to the Columbia Heights Metro station. Youngman plans to keep the lines of communication open, working with residents, community leaders and other businesses in the area to ensure Ellwood Thompson’s understands the food and community needs of the neighborhoods. He and the company would like to thank Ward One Councilmember Jim Graham, the Columbia Heights Developmental Corporation and Grid Properties for making this opportunity possible. The local, organic and natural market is slated to open in fall/winter of 2009 and will be nearly 15,000 square feet. In addition, this growth will bring 90-110 new jobs to the area, everything from managerial to general positions, with great benefits and a unique and meaningful working environment. Like the Richmond store, each department of the Columbia Heights market will emphasize local products found within a 100-mile radius. Offerings will include naturopathic vitamins, supplements and personal care, local produce, bulk, meat and seafood, wine, cheeses and fresh baked goods. Prepared foods from Ellwood’s Kitchen will be led by award-winning chef and vegan cookbook author, Jannequin Bennett. It will cater to intentional eaters as well as provide a variety of natural, organic, and ethnically diverse dishes. Those who elect to eat vegetarian, vegan, gluten-free, and/or raw foods will find plenty of options in all departments. There will be inside and outside community seating with wireless internet available. Ellwood Thompson’s will also offer incentives for conservation and recycling in the form of monetary envirocredits for walking, biking and mass transit and reusing shopping bags, water and food containers. Those who have to drive will have easy access to the underground parking deck from Park or Hiatt Streets. Sounds fantastic. Key things - Irving Street, fall/winter 2009. Here's their website and blog. UPDATE: Spokesperson Lesley Johnson just told me they'll be pursuing a license to sell beer and wine also. Just heard from Ellwood Thompson's CEO Ryan Youngman: "Nothing final as of yet. Things are progressing well, but we’re not yet done." Doh! Jim Graham: Ellwood Thompson's deal signed! Just saw in the City Paper's City Desk that Ellwood Thompson's has signed a deal! The source is a press release from Jim Graham. Great news, and stay tuned as I hunt for more details. I've been on this for a long time. I usually don't like to report on crime incidents, but this one is too much not to report - apparently there was some kind of shooting at the Boys and Girls Club at 14th and Chapin Street NW. It was about 10 pm on Friday night, and the details are a little sketchy - one report says it was a drive-by, while another says somebody did the shooting then got into a silver Jeep and drove away. Two 14-year old boys were shot, and the shooter then shot at a security guard in the Faircliffs complex. There may have been multiple people doing the shooting. The boys were shot in the leg and buttocks but appear to be ok.
To me, it seems like these kids were targeted - but that's just my impression. Pretty crazy story nonetheless. Columbia Heights Day full schedule is up! The full lineup is now up for Columbia Heights Day, and Prince of Petworth says that Jim Graham will be in the cupcake eating contest. I am there. Earlier I posted my picks for the fest (which by the way is tomorrow at the Harriet Tubman Elementary School fields). We have a winner in the inaugural NCH concert ticket giveaway for Glasvegas at the Rock and Roll Hotel! Here's their answer to my question, which was "Why should you get the tickets?" 1) I've always wanted to go to Vegas. I hear they have foot long hot dogs and I love hot dogs. 2) Scotland is one of my mother lands [along with Ireland, United Kingdom, America, and a few others. What? aren't most Americans mutts?] seeing Glasvegas will give me a glimpse of it. 3)All my friends are going and I want to be considered cool so I should probably go too. 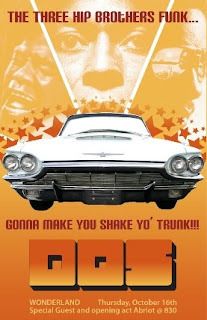 4)I've never been to rock and roll hotel and this would be as good as any of an excuse. 5) Due to the fact that I am broke because of poor economic times I have been sadly deprived of great music recently. 6)I've heard Glasvegas compared to Jesus and Mary Chains with a mix of 50's girl groups. This comparison was probably made because they are both from Scotland but that doesn't mean I like either band any less. 8) After trying to figure out something about Soft Complex, their site crashed my Internets. 9) Will there be bag pipes? 10) An Englishman, an Irishman and a Scotsman were standing looking at a prize cow in a field. The Englishman says "Look at that fine English cow." The Irishman disagreed, saying "No, it's an Irish cow." The Scotsman thought for a moment and then clinched the argument. "No, it's a Scottish cow - it's got bagpipes underneath!" Thank you to all who entered, and sorry if you didn't win. I'll have more contests soon, so stay tuned. 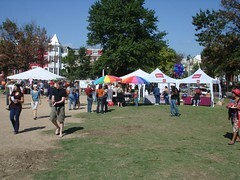 Don't forget: Columbia Heights day is tomorrow! --Petting Zoo, including a zebra. A freaking zebra! I'll post the most updated lineup soon. Hari Krishha in the neighborhood? A reader sent me this snapshot from a few days ago, pretty interesting. 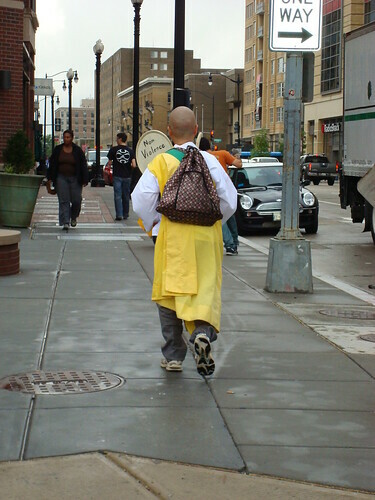 I'm guessing he's a Hari Krishna, not somebody you see around too often. Pretty interesting - a little local flavor for you. I've seen this car around before, usually parked on 14th Street around Belmont, but haven't taken a picture before. 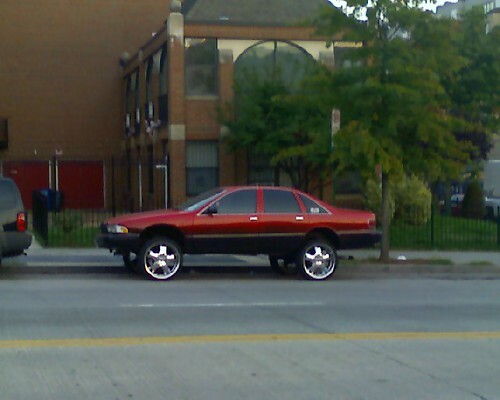 It's a Ford Taurus (I think) raised up on some big rims. Pretty rad. Columbia Heights Day is coming up! The second annual Columbia Heights Day is coming October 4th, and it's not your average street fair with fake handbag stalls and overpriced interpretations of Jackson Pollock. This quirky neighborhood has finally established itself as more UP than coming, and it's ready to celebrate. Free yoga, a pet costume parade, followed by a petting zoo...two stages featuring a capoeira performance, a mariachi group (consisting of employees of a local beloved Mexican joint), lots of bands and DJs...Moonbounce, drink/food specials at surrounding bars/restaurants AND a cupcake eating competition. Give me unlimited red velvet with cream cheese frosting and sign me up. Have you entered the Glasvegas contest yet?